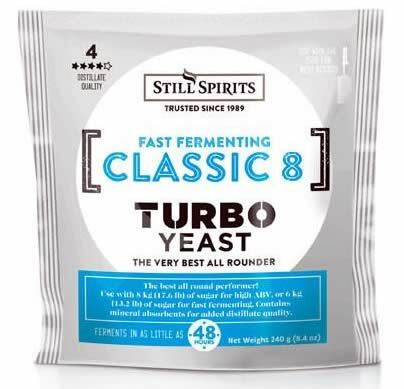 Still Spirits Turbo Alcohol Yeast produces less volatiles and ferments up to 18% - sometimes 20% - of alcohol. Our most popular 18% Turbo yeast. Classic is the best selling Turbo Yeast world-wide, performing excellently under most conditions. It’s fast, capable of fermenting 6kg of sugar in 36 hours. It reaches 18% ABV where 8kg of sugar is used and has excellent temperature tolerance. Classic has been further improved with the inclusion of new mineral absorbents, further improving distillate quality. We recommend you use Turbo Carbon as it will significantly improve the performance of Classic Turbo. Pour 8 kg (18 lbs) sugar into 8 liters (2 UK gallons, 9 US quarts) hot water, keep stirring until you are sure all the sugar has completely dissolved. Top up to 25 liters (5,5 UK gallons, 26,5 US quarts) with cold water then stir for 30 seconds. Make sure the temperature is below 25°C (86°F) then add the sachet of yeast. Stir for 1 minute. For maximum alcohol and best quality- Ferment for 10-14 days at between 19-23°C (66-73°F) air temperature.For maximum speed - Ferment for 5 days at between 24-27°C (75-80°F). Yeast will die above 27°C (80°F) air temperature. Effective for 12 extra months if kept in refrigerator. NEVER make more then 25 litres in one batch. Ingredients: active dried yeast, yeast nutrients, trace vitamins and minerals. 115g.